Create Your Own Romantic Getaway in Estes Park with our great Romance Packages. Perfect for weddings, anniversaries and honeymooners! Ready for a romantic getaway in Estes Park? Fall River Village is a perfect choice with our romance package offerings, luxury amenities and convenient location along the Riverwalk. You and your sweetheart can enjoy a 5 minute stroll to a romantic dinner in Estes Park`s quaint downtown area. 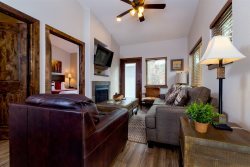 Then take your time checking out the locally owned shops on the way back, and come "home" to enjoy our onsite hot tubs or snuggle by the fire with our outdoor fire pits or in-condo fireplaces. We would love to set your room for a romantic getaway in Estes Park. We recommend an Elkhorn-style condo providing you with a jetted tub and a king-size bed or our honeymoon/anniversary suite, The Crow`s Nest. We will also have more one bedroom suite options opening for 2019, so stay tuned to our website for more details. All our accommodations offer a fully stocked kitchen with full-size appliances to make a romantic meal together, a loveseat/sofa in the living room, smart HD TVs and WiFi to stream your favorite movies on Netflix/Amazon and a balcony/patio overlooking the river or mountains. You truly can make Fall River Village your mountain home away from home. It`s the perfect weekend getaway. You can choose from any of the following items to add to your reservation and create your own romantic experience! Please mention your chosen items when making your reservation. These options must be finalized 72 hours before check-in. Relax, celebrate, get pampered and explore! Why not spend some quality time together in a new place. We can help make your stay an adventure and a retreat! There`s nothing like having a romantic surprise waiting for your partner in your condo when you get back from the day`s adventure! Our staff is always happy to help make your time here special and recommend activities for any type of interest. Fall River Village is a great home base for your romantic mountain adventures any time of year. In summer, you can enjoy a bonding horseback ride into Rocky Mountain National Park, take a joy ride through Trail Ridge Road or choose a hike and see where the trail takes you together. In winter, there`s ice skating, guided snowshoe treks or even guided back-country skiing (not for the faint of heart). Evenings can be enjoyed wine tasting or checking out local favorites like The Rock Inn Tavern.